If you’re like me, there are things in your life you’d like to accomplish, but you never seem to get to them. For me, the reasons range from other responsibilities, firefighting of the urgent, other people’s priorities that seem to become my responsibility, wasted time on social media (bane of my existence! ), fear, inertia, and just plain never getting around to it. When I have a spare moment or afternoon, this “thing” isn’t top of mind, so I never get started. That’s why I like Seth Godin’s quote above. It’s not that I don’t have time; the issue is I don’t decide. I don’t decide this action is important enough to put it on my calendar. As we conclude this blog series on rhythms of productivity, it’s time to decide. 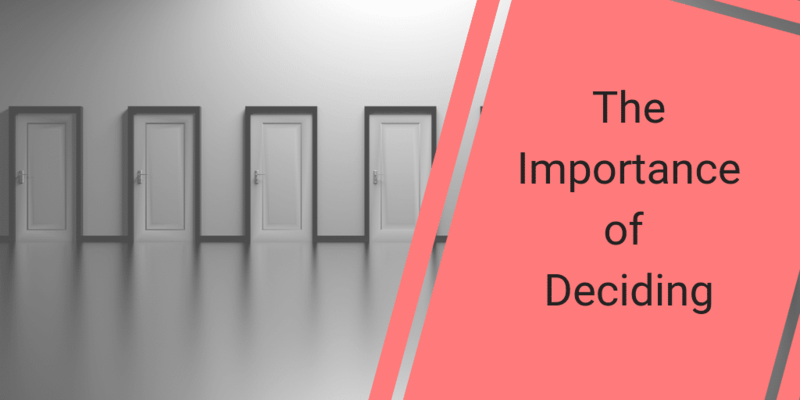 It's time to decide what is your highest priority – what is the most important thing for YOU in this season of your life vs. the urgent, which is most often driven by external inputs. We all have responsibilities – work, family – whether children or aging parents – commitments we’ve made to others. Some of these responsibilities won’t change for the foreseeable future. Children are a commitment for several years, though the responsibility of the commitment looks different between infant/toddler/preschool years and high school. Regardless of our commitments, if we decide we can achieve amazing things. I’ve seen busy people accomplish college degrees, start a business, build a house, strengthen family relationships or work diligently for a cause while working full time and staying engaged with family responsibilities. They reach their goals by intentionally deciding and managing their time accordingly. This doesn’t mean they don’t have to make sacrifices, but they are sacrifices they choose to make to achieve something important to them. Recently, I came across this model from Dan Miller, author, entrepreneur, and leader of the 48 Days Eagles community. The model lays out a time management program to reach a goal working 15 hours per week. The concept can also be used to build a business or non-profit, obtain a college degree or certification, or do the work needed to explore your Masterpiece Work and move into the new area you’ve discovered. Dan’s plan uses 15 hours per week. You may only have 10. The concept is the same. It starts with deciding. Here’s how it breaks down, based on 15 hours per week. What could you accomplish if you pre-decided you were going to spend 10 to 12 or 15 hours per week on a goal you want to realize? As Kent Julian, professional speaker and fellow 48 Days Eagle pointed out, in one year that 10 to 15 hours per week amounts to 12 to 18 40-hour weeks (And I allowed for two weeks of vacation!) Imagine what you could do in a focused period of 12 to 18 weeks. We need periods of rest and renewal, but we also need the motivation of accomplishment, achievement and working toward a goal. As we close out this blog series on Rhythms of Productivity, where will you decide to focus your energy? What accomplishment needs your intentional attention? How can pre-deciding to make it a high priority make it a reality? Share with us what you decide to accomplish.